During the 80’s and 90’s when I lived there, San Antonio offered some unique and exciting sounds of its own. In addition, many great Texas acts performed in town. There were serious dry spells, however, when it came to touring acts, or “road shows,” as Texans like to call them. Things improved in late 80’s when the beautiful, historic Majestic Theatre was renovated and began to feature musical acts and Broadway plays. My fortunes were furthered when my employer purchased a box at the theater allowing me easy access to great seats. 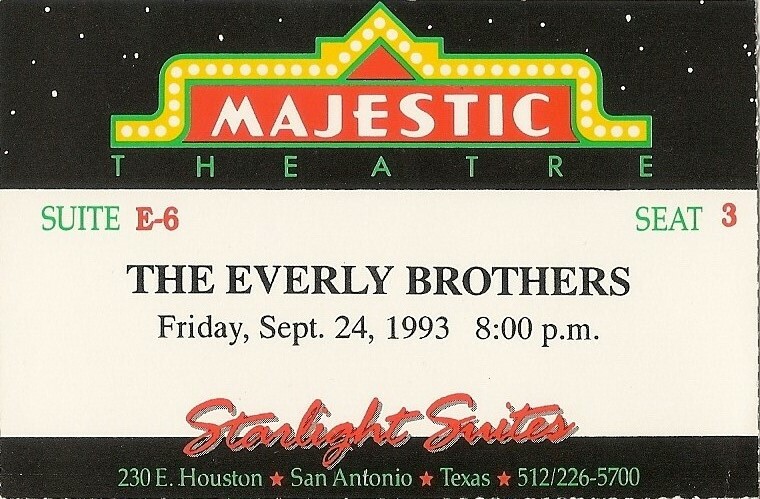 I was thrilled at the chance to see The Everly Brothers. Like many of my generation, I knew their hits from the radio and further studied them in respect to their influences on several artists of my generation (The Beatles, Simon Garfunkel, etc.). Ten years previously, in 1983, they made a glorious comeback overcoming their infamous sibling-squabbling for a historic reunion concert at London’s Royal Albert Hall. This excitement spawned Paul McCartney writing a new song for them and a follow-up record produced by Dave Edmunds. For whatever reason, I left this show without any lasting fond memories about it. I recall that the brothers appeared awkward together. I can’t say their singing that night knocked me over. Regardless, it is still an honor that I got the chance to be in the room with these musical legends. I just wish I was left with a more favorable recollection of what went down that night.